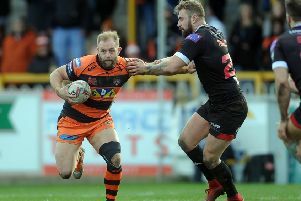 Castleford Tigers head coach Daryl Powell has praised the efforts of Warrington and Wigan to give English Rugby League a timely boost with their victories in the World Series games last weekend. After a winter of discontent for the game it was a shot in the arm when the Warriors beat Cronulla Sharks to become World Club champions and for the Wolves to defeat Brisbane Broncos in their World Series game. As a big advocate of the game over here, Cas boss Powell was pleased to see both sides achieve their victories. He said: “I was pleased for the English game with both of the matches against the Australian clubs. “Both Wigan and Warrington deserved their wins and were the better team. “Warrington looked sharp, athletic and strong and really challenged Brisbane, putting them under so much pressure with the way they moved the ball. We recognise the challenge of what’s going to be needed for us this week against them. It’s tough. “Last week they only made two errors in the whole of the game and to play in that way it goes one of two ways for them, either they make a few errors and put themselves under pressure or they do what they did last week and everything sticks. Powell was impressed with Warrington’s new signing, Kevin Brown, in the half-back role. He added: “Kevin Brown is a really good player isn’t he? “He played the way he did for Widnes last week in the Warrington team. People were a little bit unsure as to whether he would suit them, but he certainly did last week. “He’s a clever player with his passing and kicking game in particular. “He was exceptional last week and he controlled the game, but I thought all the Warrington players stepped up from what they had done previously - I had watched their pre-season game against Huddersfield and their first Super League game against Catalans.